ALBANY (January 25, 2017) — The College of Saint Rose presents The Wood Brothers in concert Friday, February 3, at 7:30 p.m. on the D’Arcy-Brady Stage in the Kathleen McManus Picotte Recital Hall, Massry Center for the Arts, 1002 Madison Ave., Albany, New York. Dubbed masters of soulful folk by Paste, The Wood Brothers released their debut studio album, Ways Not to Lose, on Blue Note in 2006. Chris Wood already had legions of devoted fans for his incomparable work as one-third of Medeski Martin & Wood, while his brother Oliver toured with Tinsley Ellis before releasing a half-dozen albums with his band King Johnson. 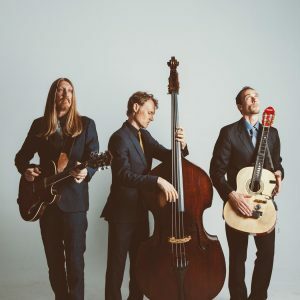 Almost a decade later and with drummer Jano Rix added as a permanent third member, it is clear that The Wood Brothers is indeed the main act. This concert is sold out. For additional concert and ticket information, contact the Massry Center ticket office at 518-337-4871 or email concerts@strose.edu. Opened in 2008, the critically acclaimed Massry Center for the Arts features the 400-seat Kathleen McManus Picotte Recital Hall, Esther Massry Gallery, choral and instrument rehearsal rooms, teaching studios, piano labs and classrooms. Past performing artists have included B.B. King, Chick Corea, Dave Brubeck, Stewart Copeland, Béla Fleck, Toad the Wet Sprocket, Doc Severinsen, Ramsey Lewis, Maceo Parker, Mary Lambert, Tim Reynolds, Stefon Harris, John Pizzarelli, the Boston Symphony Orchestra Strings, Yuja Wang, Paula Cole and the Preservation Hall Jazz Band. The 46,000 square-foot gem is certified LEED Gold, ranking it among the Capital Region’s most energy-efficient and Earth-friendly buildings.